This badge was issued to Fioravante A. Bossi on 04 Oct 2018. 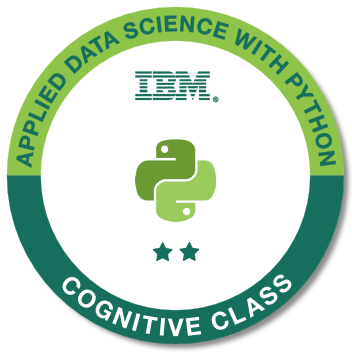 This badge earner is able to code in Python for data science. They can analyze and visualize data with Python with packages like scikit-learn, matplotlib and bokeh. Successful completion of the course Python for Datascience. Successful completion of the course Data Analysis with Python. Successful completion of the course Data Visualization with Python.